Temporary People, the latest novel from Steven Gillis, is a dizzying display of genre-bending delight. Blending fantasy, literary fiction, and sharp social satire, the book is as refreshing a novel I have read all year. 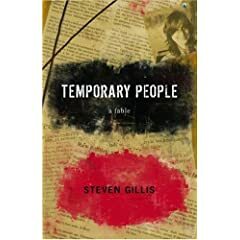 "Temporary People is Gillis’s fourth book and his finest work to date. Balancing world-building, a thriller-worthy plot, and high-end political dialogue, Temporary People is the kind of book that forces the reader to fight between turning the pages faster to find out what happens and slowing down to consider its arguments and to savor its sentences." I got the idea for Temporary People around the time George W. Bush was elected president. As pissed and surprised as I was, I couldn't help but wonder how the hell this happened. (And not once but twice!) How did a moron become the leader of the free world? It's an astonishing development and one which lead me from there to ask the question: What can we do about it? This is the fundamental question being raised in Temporary People. What can any one of us do to when we find ourselves under an oppressive government, one that is intent on taking away our liberties, distorting reality and messing with our lives. What if the called for response clashes with our personal philosophies? I am by nature a pacifist - though those who have argued with me might disagree. I am against the war, against violence. Yet, what if the only way to get rid of a despot was to put a bullet in his brain pan? Is it ok? Is it indeed the intelligent decision or must one maintain their personal convictions in the face of adversity? Temporary People has been described as: "A political fable of the first order, sharp and satirical, a hilariously insightful romp." I hope this is true. My intent when writing the book was to examine every option from all sides, the pros and cons of passive resistance, bloody coups and rebellions and collective indifference. The story - I hope - works well in subscribing to what Swift said about relying on humor and a hint of satire when addressing a serious issue. In the end, I reach no easy conclusions. Hell, I'm not so smug as to assume it is in my purview to reach any conclusions at all. I am, as a writer, an observer. The only truth I know is that, at least for me, ultimately, all we can do is follow our hearts. What else is there? Gaye was a genius, light years ahead of his time. His music, his lyrics, his arrangements. Man had huge stones. Great artist. Songs still as relevant today as when they first came out. Both tunes are quoted in Temporary People. The most ironic, in your face anthem of its kind. Also appears in Temporary People. The sort of song that you can't sit still and be complacent after hearing. Dig the song. Another call to arms in its own way. Perfectly pitched and actually nicely redone by Counting Crows. Man can't sing but damn the lyrics in this song are about as perfect and moving as anything ever written. His voice is pure angst and makes the song that much more magical. Another tune where the lyrics are front and center. The music is top flight but its the words that grab me every time. Ok, I am a sucker for pop, what can I say? I dig the tune. Its catchy and moves me whenever I hear it. Song is 30 years old but still gets me hopping every time. Just have to hear the first bar of the opening riff and I not only recognize the tune but turn up the radio. My daughter, Anna, is gonna play her version of the song at her gig at the Ark. How cool is that? Only 13 yrs old and already playing pro gigs and banging out dad's favorites. Great group, amazing live. Love jazz fusion into pop with strong musicianship. Knockout singer and songwriter whose lyrics and delivery are beyond powerful in their honesty and integrity and dead on perspective. Man this dude can sing and write and play guitar. This tune and his underrated second album are worth a listen and make us forgive the radio for playing the song "Trouble' to death. Talent oozes from the disk. Fun stuff with a serious underbelly. Makes you stop and go, "Ahh." I told you I am a sucker for pop, but great tune. There's a reason the tune was such a smash and these dudes are much better unplugged. Besides a duo that makes me think of the NBA and the round mound of rebound has to be cool. Man died much too young this year. His early albums were pure honesty and brilliant. Will be missed.